Hinge, the relationship app, is taking a different approach to online dating. Instead of encouraging casual dating, the Hinge app is designed to help individuals build meaningful relationships. With Hinge, users can upload both photos and short videos intended to help them strikeup two-way conversations that foster stronger connections and turn virtual connections into real romance. Cloudinary was integral as Hinge began to develop the next version of its app. With Cloudinary, Hinge can now support direct uploads from users’ devices, resizing and cropping images on-the-fly to fit the graphic design, and optimizing the quality and format for improved performance. Users also can upload 30-second videos to their profiles, a feature that sets Hinge apart from other dating apps. "Videos help our users share richer representations of themselves, building trust and rapport with one another through authenticity,” MacGougan added. "Implementing video is hard and we looked at several options to support user-uploaded videos, but Cloudinary’s simplicity, automation and ability to scale made the choice clear - and we haven’t lost sleep since. We are thrilled to highlight that 75 percent of videos are uploaded through Cloudinary, rather than streaming from social accounts, which is having a positive impact on performance and user engagement." People are more likely to abandon websites and apps if they experience slow load times or have difficulty viewing content. Dating apps are no different. While Hinge’s focus is creating a more genuine dating experience, its also needs to ensure that the app works smoothly and offers users capabilities other apps didn’t have. 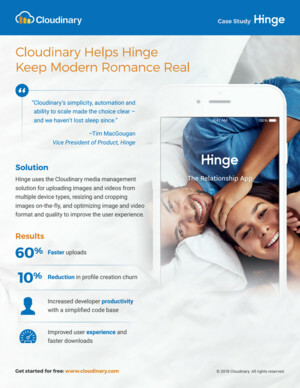 Cloudinary enabled Hinge to make its app more user friendly, improving the experience and, ultimately, continuing to keep modern romance real. With the added flexibility, Hinge was able to reduce profile creation abandonment by 10 percent. This improvement can be attributed to the fact that users can now upload their favorite images directly from their devices, which is 60 percent faster than loading images from Facebook and/or Instagram.